We offer Rubber Hand Gloves that are widely used in different production units and hospitals. Manufactured using 100% latex material, our range of Rubber Hand Gloves provide excellent grip to hold wet and slippery objects. Also, these Rubber Hand Gloves provide protection against germs, abrasions, cuts and chemicals. These Rubber Hand Gloves are used in handling cutting chemical dipped sheets metal components and other chemical purpose like manufacturing and handling acid batteries. 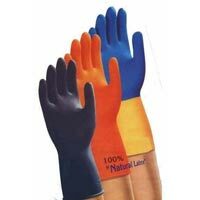 Clients can avail these Rubber Hand Gloves in different sizes and colors at the market leading prices.